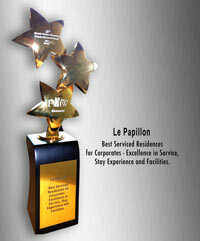 Award Winning Best Serviced Residences for Corporates - Excellence in Service, Stay Experience and Facilities. This exotic name for an interesting species is sure to meet with quizzical expressions on its pronunciation and meaning.Spoken in French as Papi yon-, it refers to the magical, entertaining, multi-faceted butterfly.A unique ability to cocoon in serene isolation and then magically transform with added zest and personality, are common characteristics to this place and its namesake. The team made us feel very comfortable. Very efficient.|Very Good and Professional Service.|Nice & Comfortable stay.|Excellent Service enjoyed my stay.|Very Good Service. Kitchen facility is good and the kitchen staff is excellent.|The Staff is Fantastic as Compared to any other location.|It was a very pleasant experience.|I don�t have the feel of stayed in a external guest house.. Extremely Home Like feeling.|Thanks for your service & attending to all our needs.|Very Nice stay for a family of Five. Thanks|Its good and very homely and we enjoyed the stay here.|I have Enjoyed a lot and find it very Comfortable to stay. Looking forward to meet you in future.|It was a great experience.|Had a wonderful time staying here. My stay was very comfortable.|Good and Prompt Service - Thank you|Excellent Service.. Please Keep it going|Well Maintained and Homely Feeling|It was nice to stay somewhere that felt like home. I will be back"|"Overall stay-Excellent, keep it up!"|Fentastic.. Best Guest house ! Copyrights 2004-05.www.lepapillonindia.com. All Rights Reserved.